Every day someone asks me the same question, onion juice helps in faster hair growth, it is true? The answer is simply ‘YES’. Onion contains sulfur and has anti-bacterial properties to prevent scalp infections that contribute to hair loss. Onion juice improves the blood circulation and expedites hair growth. It also helps to prevent premature greying of hair. 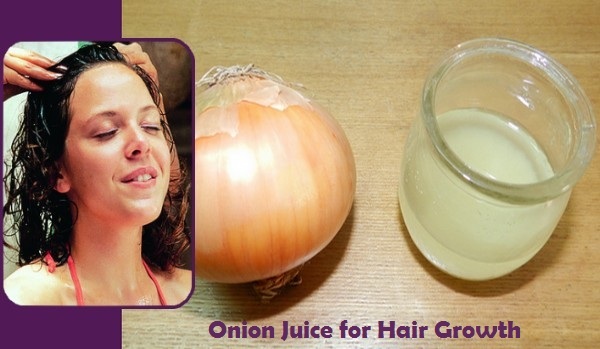 So, today I am telling you two most effective ways to use onion juice for fast hair growth. You will need one small piece of onion. Squeeze the juice out with the help of food processor, a blender or a juicer. Take at least 2 tbsp juice and apply it on your scalp or bald spots. Gently massage for few minutes and leave it for 30 minutes. Now, wash your hair using a mild shampoo. Follow this daily or at least 2 times a week for fast hair growth. Mix 3 tbsp of onion juice with 1 tbsp of honey. Apply this paste on your scalp and wait at least 30 minutes before rinse it off. If you are not comfortable with raw onion smell, then you can mix it with honey.